While this shouldn’t come as a surprise, somehow it did. 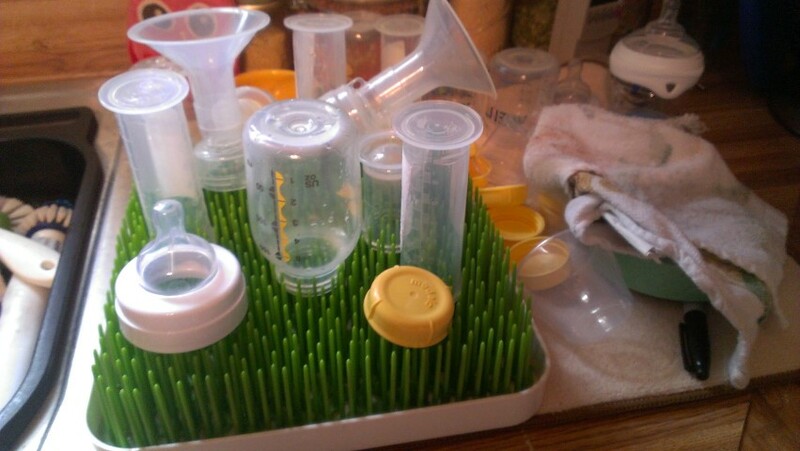 Clean your Boon Winter Grass Countertop Drying rack regularly or you’ll end up with a moldy mildewy scum pit producing penicillin that has to be scoured by near-boiling temperatures and alcohol. Luckily you can just chuck it into the dishwasher, although I would advise afterwards hosing the thing down to prevent any detergent from coming into contact with baby stuff later on. Detergents probably aren’t going to harm a non-sensitive baby, but might mess with stomach bacteria leaving you with a diaper disaster in a few hours. Actually, I’d never bother with the boiling water or using alcohol unless you’re just periodically spraying it down to prevent mold, mildew, etc. If you don’t have a dishwasher just soak it down with some soapy water and scrub what you can. For powered-on scum, soak the unit in a pot or something to release the hold. While the material that the unit is made from should theoretically survive boiling water, it might not survive contact with the bottom of a pot and you might end up with a very clean drying rack that’s now permanently molded to the bottom of the pot you were attempting to clean it in. Keep in mind that detergents like bleach or alcohol are effective and safe when washed off completely, but mention you used any of these and see if Mr Superior Parent doesn’t have some horror story made up to attempt to scare you with and imply or outright say that you’re a terrible parent for even contemplating anything that might be effective. But, bleach is overkill, and with the way that the thing is designed, getting bleach on everything would be an endeavor that would probably leave your clothes looking a bit acid washed.